Solaractive Threads are new brand of UV embroidery thread designed for high-speed embroidery machines that changes color in the sunlight. The threads remain in full color as long as they are exposed and return to their original color a few minutes after removal. 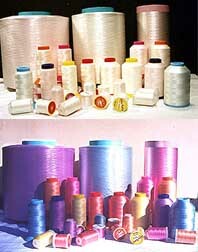 There are a total of nine color changing threads available. Seven of the threads start out while and, when exposed to sunlight, turn to red, yellow, orange, pink, purple, green, and blue. In addition, two threads change colors from orange to hot pink or turquoise to purple/blue when exposed to UV light. The new technology provides the opportunity to have embroidery designs change from one color to another after exposure to the sun or any UV light sources. The threads work on embroidery machines up to 1200 rpm with any bobbin thread. The threads are machine washable, and can withstand up to 420°F (for patch embroidery or emblems). The threads are 120-danier/40 wt. Available cone sizes are 1,000 m (1,000 yards) and 3,000 m (3,300 yards). Also available are starter kits with threads available on 200-yard spools. The manufacturer states that the changing effect was tested and proven to last more than 2000 times in and out of the sun (equivalent to the life of a garment). Solaractive International, 18740 Oxnard Street, Suite 315, Tarzana, CA 91356. Tel: 818-996-8690. Fax: 818-996-8172.